Kevin Durant's injury narrows the margin of error for the Warriors. The offense should be fine, but Golden State faces some serious adjustments with KD sidelined. In the space between Golden State’s Tuesday night game against Washington and an official announcement the next morning, the NBA came to a halt. The result of the game was almost beside the point. Of greater interest was the concerning way that Kevin Durant had left it, the result of unfortunate and incidental contact with teammate Zaza Pachulia. A box-out tussle with Wizards center Marcin Gortat had sent Pachulia to the ground, where the back of his head collided with Durant’s knee. There was a visible jolt for Durant—the kind that immediately sparks fears of structural damage. Those fears were only heightened by a somber Warriors locker room and the news overnight that Golden State would scrap its plans to add Jose Calderon so that it sign forward Matt Barnes instead. What was initially diagnosed a hyperextension was later clarified: Durant had suffered a moderate MCL sprain and a tibial bone bruise, the combination of which would leave him to be re–evaluated in a month’s time. Should Durant be cleared to return then, he would have a few weeks to spare before the start of the playoffs—a relief to the Warriors in light of what could have been. “The good news is he's in a position where he'll fully recover long-term,” Warriors general manager Bob Myers said on Wednesday, per Anthony Slater of the Bay Area News Group. “In the short term, we'll see how his body responds." One of the many, many perks of adding an all-time great player to the core of a 73-win team is the way it trains focus on the big picture. Durant missing a month could be a real problem for most any other franchise. Yet for Golden State, his injury likely won’t cost them the No. 1 seed and may not cost Durant a single playoff game. If any team can weather Durant’s loss, it’s the the 50-10 juggernaut outscoring opponents by 12.5 points per 100 possessions. All this does is narrow the margin for error. San Antonio lurks in the standings just as it did last year—this time only three games behind Golden State in the loss column. Those two teams will meet twice the rest of the way. Both are Spurs home games with the Warriors on the tail end of a back-to-back. San Antonio, to counterbalance, has the most difficult schedule in the league by opponent’s record the rest of the way. Still, Golden State will need to get up for those head-to-head affairs to keep hold of the top seed. and Stephen Curry, Draymond Green, Klay Thompson and Co. will need to stave off periodic dips in their effort and focus in general. Every advantage in their favor looks to be a bit smaller over the next four weeks, to the point that it will demand more of the Warriors to preserve their standing. Playing without Durant removes the Warriors’ broadest, widest safety net. The most accessible go-to scoring option is out of the mix. Durant’s versatile defense will leave a void—as his will his rebounding for a team that tends to run small in his absence. Golden State will lean on Barnes (who, it should be noted, was pretty crummy in Sacramento this season), Pat McCaw, Shaun Livingston, and other situational contributors just a bit more than is usually comfortable while managing Andre Iguodala’s minutes for the stretch run. That’s still all well and good when Curry and Thompson have the firepower between them to carry the Warriors most nights, which in conjunction with Green’s passing still makes Golden State one of the NBA’s most difficult covers. A team that ranks first in offense and sits in a virtual three-way tie for the best defense can lose Durant for a few weeks and still beat the lion’s share of its opponents. It also should surprise no one if last year’s unanimous MVP ekes back into the conversation for this year’s award. It’s a crowded field between James Harden, Kawhi Leonard, LeBron James, Russell Westbrook, and until this latest sprain, Kevin Durant. But Curry’s play is strong enough to register and he’ll have four weeks to pop in a more familiar lineup construction. Golden State is unbelievable with Curry and Durant on the floor together. Yet the fact that it can still be damn good with Curry alone could give him a narrative plug to go along with the very real influx of opportunity coming Curry’s way. The offense should largely be fine in his hands, even if Warriors coach Steve Kerr will have to adjust his rotation to account for losing Durant. It’s not as simple as plugging in other forwards and calling it good; replacing Durant with role players is the kind of move that will likely require deeper changes to Golden State’s lineup construction and substitution patterns. The fallout remains to be seen. If anything, the Warriors’ defense could suffer from the ripple effects of trading down in size on the wings and down in versatility in the frontcourt. Iguodala might be able to remedy some of that, but there’s no actual need to push him behind his 26-minute sweet spot. 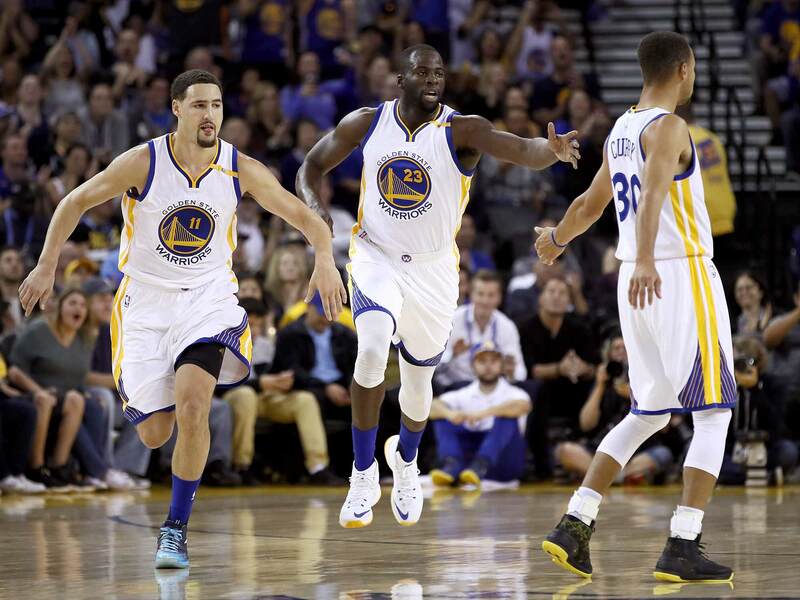 Whatever the Warriors lose defensively is likely to be overwhelmed by a high-functioning, impeccably spaced offense. This is the world the Warriors live in—one where shots can be handed off from one MVP to another, where an outstanding defense can bend without breaking, and where a trio of All-NBA talents can make do in the absence of four.